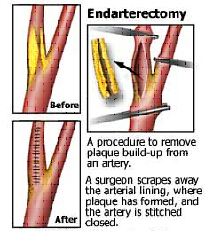 Carotid endarterectomy is an operation during which the surgeon removes the fatty deposits to correct the narrowing and to allow blood and oxygen to flow freely to the brain. These two main arteries, one on each side of the neck, deliver blood and oxygen to the brain. Plaque builds up in large- and medium-sized arteries as people get older, more in some people than others depending on lifestyle and hereditary factors. 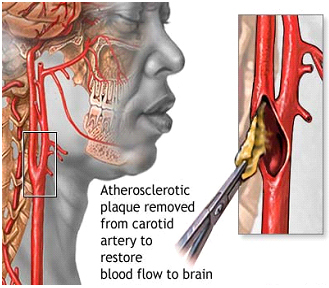 This build up is a vascular disease called atherosclerosis, or hardening of the arteries. The procedure takes about 2 hours to perform but may seem slightly longer depending upon the anesthetic and preparation time. For carotid endarterectomy, a general anesthetic or a local anesthetic (to numb the neck area) may be used. If people remain awake during the Carotid endarterectomy operation, the surgeon can better evaluate how the brain is functioning. The surgeon makes an incision in the neck over the area of the artery that contains the blockage and an incision in the artery. The blockage is removed, and the incisions are closed. For a few days afterwards, the neck may hurt, and swallowing may be difficult. Most people can stay in the hospital 1 or 2 days.